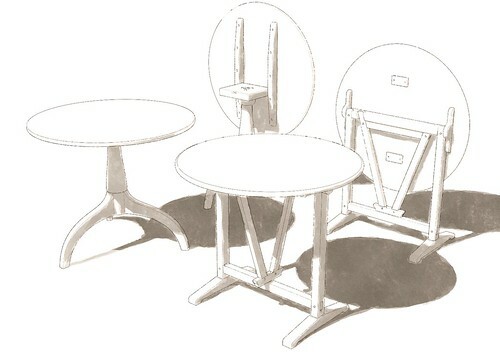 Here are a couple of tilt top tables I modeled recently for plans for Fine Woodworking. On the left, Tom McLaughlin's take on a Shaker-inspired tilt top table, and on the right, Will Myers's version of a wine tasting table from Tryon Palace in New Bern, North Carolina. I think the wine-tasting table may be a French design; a few years back, I saw a 19th century table that's the spitting image of Will Myers's on the One King's Lane web site. I think you're right, David. I've seen a few examples of tables that work like that one. Some are much more ornate in the undercarriage. I've often thought all horizontal surfaces in this house need to tilt like that when you leave them unattended for more than 15 minutes.